Is it safe to eat your cookie dough raw? Absolutely! We only use pure natural and wholesome ingredients. We ship anywhere in the continental US! Incognito? Undercover? In your pajamas or on your 15 minute break? Place your order by phone and we will hand deliver to your car! Are custom orders available for catering and private events? Yes! We can accommodate all of your party and private event needs. We even make custom flavors and packaging for your party. Yes, there are perishable ingredients in the cookie dough that should be kept cold. Is your cookie dough nut free? 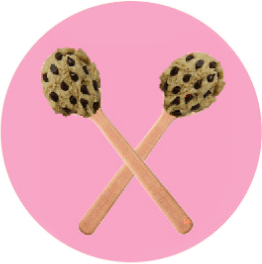 All of our cookie dough batters are nut free, however we do offer nuts as toppings and in some of our flavors. Yes, we offer a plain gluten free cookie dough and let you choose your own toppings. There are endless possibilities! Do you offer sugar free cookie dough? Yes, You won’t be able to tell this dough-licious dough is sugar free. Do you offer vegan cookie dough? We offer a completely vegan cookie dough base and let you choose your toppings. We have scrumptious cupcakes, chocolaty brownies, dough pops, fudge, gelato, organic fresh popped popcorn and of course fresh baked cookies. We have fresh brewed organic coffee, icy cold milk, almond milk, rice milk, a variety of soft drinks and home made hot cocoa. Your whipped cream is amazing! How do you do it? Yes we agree, we went all out! We use only the best, a European heavy whipped cream machine. All of our whipped cream is made fresh daily. Once your order is placed we will overnight it in an insulated box with plenty of ice packs. We will give you an estimated delivery date to make sure your home in time to receive your goodies! Can I make my own flavor dough? Yes! We have an entire wall dedicated to candy and toppings. If you want to make your own flavor, grab a goody bag when you come into the store and fill it with whatever candy you want. We’ll mix it into our plain or flavored cookie dough for you. Can I purchase the bulk candy without cookie dough? Yes, all of our bulk candy is available for sale. What kid friendly products do you have? We have a special space on our candy wall just for kids and kids size scoops available. Can I book your food truck for private events? Yes! Our food truck is available for parties and private events. We can accommodate birthdays, weddings, anniversaries, wrap parties and much much more. How do I know when and where your food truck will pop up? Check out our calendar page on our website. We have 90 minute free parking in front of our store in addition to all day free parking in the parking structures on Magnolia.